how can I use the bpmn-connection with custom-element? I want that when connecting the elements, whether custom-element or BPMN-element, the BPMN-connection comes. Can you elaborate on your use case for custom elements? How are you implementing them? What do you want to achieve that requires custom elements? Are you using an example as a starting point? Without any context we won’t be able to help you. we can take the example from bpmn-js: custom-elements (with the green triangle and blue circle). Here orange connections were created for the custom elements. 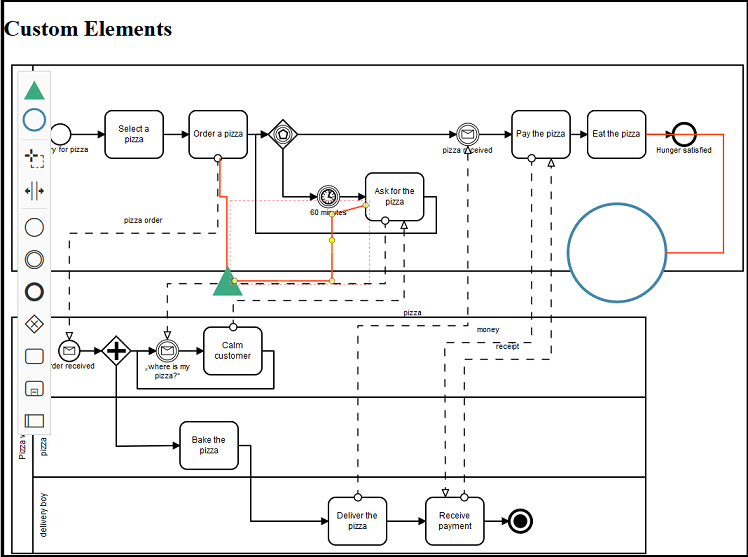 However, I would like to have the typical bpmn connections here (black arrows that are initially vertical and horizontal with arrow ends). If I delete the CustomConnection for the custom elements in the code, I get pink connections direct to the other Element without an arrow (I suppose that’s the default). I hope I could clarify my request, otherwise tell me and I will try to create a mockup example. I see that recently a new CustomElement example with other custom elements has replaced the old one. I’m asking you again to elaborate on your use case for custom elements. Why do need them? What do you need them for? I suppose the example you’re using doesn’t suit your use case. As for the updated examples, yes, we have updated the section about custom elements. We hope there’s going to be less confusion about custom elements in the future.